To be honest with you, I resisted music streaming for a long time. I’ve always been a CD guy. I bought my first CD in 1995 when I was 10 years old. From then on, I knew in what format I wanted my music. Shortly after, I discovered the Walkman and the Discman. If you grew up in the ‘80s or ‘90s, you’ll know exactly what those are! I used to rip some of my favorite tracks from CDs to a cassette, so I could listen to them on the Walkman. Obviously, there was no such issue with the Discman, but you had to choose which CDs you were going to take with you. The portable mp3 players solved that problem as you could store a lot more songs in one CD – but you still had to rip songs onto a CD! When I was first introduced to iTunes and to the iPod more than 10 years ago, I was thrilled. This seemed promising. I could still buy and keep my beloved CDs, but iTunes now allowed me to store all my songs in one library and the iPod allowed me to take all of it with me. I’m not going to get into the argument of whether Apple was the first company to come up with this concept or not. Quite frankly, I don’t care who did it first. It is a fact, however, that Apple popularized it. iTunes quite literally changed the way we consumed music. Some would argue for the worse, but I disagree. I liked iTunes a lot. 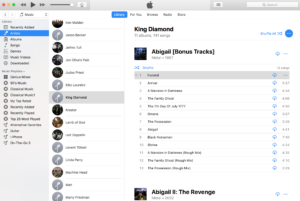 I’ve always liked the way iTunes organizes music. As of 2018, I still buy CDs. And I will forever keep the CD collection I’ve built. Those things have not changed. What has changed is that I’m a bit more selective lately. This is mainly due to space issues. I’m a city guy and if you live anywhere near Boston as I do, chances are you’ll be living in an apartment. The reality is that you just can’t keep buying physical products if you can’t store them! So, for a long time, I bought albums on iTunes more than I did CDs. I’m an album guy, so I was never too big on buying random songs here and there. If you’re gonna get to know an artist, you need to know their albums! Anyway, I’ll air my grievances with “single song buyers” at a later time… But this was one reason transitioning into buying from iTunes (i.e. not having to rip a physical CD first) wasn’t too difficult for me. As long as I could still support the artists and have access to a full album, I didn’t always mind that I didn’t have the CD. While all this was going on, Spotify was gaining momentum. It got to a point where it was nearly impossible to have a conversation about music without someone uttering the word “Spotify”. I remember checking out the free version for a bit but then deciding that it wasn’t for me. For a long time, I was either ripping my CDs into iTunes or buying an album directly from the iTunes store. My preferences slightly changed in 2016. I launched Mega-Depth and I needed to do more research on some artists before I wrote about them in detail. It was going to be very difficult without streaming to get to a certain random album or song that I needed to analyze. And keep in mind, a lot of times these things need to happen fast so I can get started on an article that may take a long time to finish. Of course, there are other reasons why I was interested in getting into streaming (getting recommendations, creating “radio” stations based on an artist, accessing millions of songs if I’m in the mood to listen to one random song here and there) and I, of course, use streaming for personal consumption too, but I wanted to have this kind of access mostly for Mega-Depth. Before I go on further, I should note that this opinion piece is only meant to compare the streaming services based on design and musical selection. I am not getting into the financial side of things as that’s a completely different topic. A lot of musicians are vocal about the fact that they don’t make much at all from the streams their creations get. Our way of compensating artists has not evolved to take new technologies into account. That’s exactly why I still buy albums (CD or iTunes Store) if I like the music a lot, or if an album from a smaller band is only available on Bandcamp I purchase it there. I try to do my part in support of artists because I believe in fair pay. The Music Modernization Act (MMA) that was signed into law on October 11th is aimed to make things fairer for musicians and I’ll be watching closely what artists say about what their experiences have now become. Let’s go back to streaming. 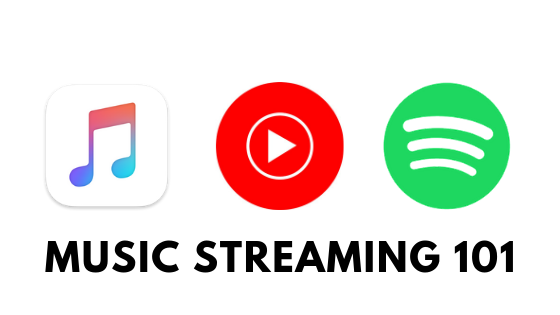 In this article, we’ll talk about 3 of these services: Apple Music, Spotify, and YouTube Music. They all offer their subscription at the same, or very similar, rates. So, this will boil down to personal preferences. What you’ll read below are super subjective because, well, it’s just my perspective. But hopefully, it’ll help you along the way if you are on the fence about some of these services. I’ll tell you my favorite right off the bat. It’s Apple Music. As much as Apple gets some flak over some issues, I think they’ve done a good job with their music services. Spotify would be a second – but I wasn’t as blown away as some people seem to be. And YouTube Music, which is the newest of them all, wasn’t very user-friendly but it’ll likely improve. I subscribed to Apple Music as soon as they launched. I was on the fence about music streaming in general, but I had an iPhone, was already using iTunes for my music, and the idea of Apple Music directly integrating with my already built iTunes library sounded great. They were offering 3 months trial at the time, so I grabbed it. The thing I like most about Apple Music is that both the desktop app (iTunes) and the mobile service offer great user-friendly design. They didn’t abandon one for the other. And if you are already using iTunes, it is super convenient to have the integration. For example, if I already have 9 albums from an artist from ripped CDs, and I add the 10th from Apple Music, it automatically gets categorized under the same artist in my library. If you are an albums guy like me who likes to explore the changes in an artist’s discography, this is excellent. Besides, sometimes I buy CDs that are not a part of the artist’s streaming package. It’s great, then, to still be able to access all of these albums together. The integration is pretty seamless. The only criticism I have is that sometimes Apple Music will synch the wrong version of the same song and that can get annoying. For example, for the longest time when I tried to play “Tornado of Souls” (album version) from Megadeth, I would get the live version from the Live Trax album. It didn’t make much sense to me because I ripped that from a CD, so I thought it should just play whatever I’d ripped, but apparently, the database sometimes synchs the title with the wrong version. They have since corrected that issue with this particular song, but I know from my research that this still happens to some users. Apple Music is also much better with design and additional information. First and foremost, it features a more album-oriented design. I’ll get to its competitors in the following paragraphs, but whenever you search for an artist, you get clear results with songs, albums, playlists, etc. It is very easy to tell exactly what you’re about to click or tap on. But albums will always be there and the songs will be listed neatly. Actually, they did such a good job with some artists that you’ll see the regular version and the remastered version of an album side by side. It’s really well organized. They also do a good job of being very precise with artist names. For example, the Queen albums don’t list anything released under the banner “Queen + Paul Rodgers” because technically that is a separate musical group. Apple Music also gives a lot more accurate info about songwriting credits and lyrics. They don’t always have that info – but at least it is super easy to add lyrics or credits to the song’s info later if you would like to have them stored. They have actually gotten so good with their lyrics database that in the newest version of Apple Music, if you can’t remember the title of a song or who sings it, you can search for the lyrics that you do remember and it’ll tell you what song you may be looking for. Listening to music becomes a much richer experience with the details. That’s what differentiates a true music aficionado from a casual listener. So, from that perspective, I think they’re doing a much better job. I just wish that electronic album booklets were more common so I could even more out of albums. Next, I’ll jump on to YouTube Music before I get to Spotify. I didn’t actually intend to subscribe to YouTube Music – I have it because I have subscribed to YouTube Premium and it came with the package. I’m glad it did because I enjoy checking out new services; and YouTube, owned by Google, has the potential to make it something incredible. I joined YouTube Premium because I go through a lot of YouTube videos in a day. Especially after the launch of Mega-Depth where I use interviews with artists as part of my research, the time I spend on that site tripled. And when that’s the case, you’re not gonna want ads interrupting you as frequently as they do! So, I bit the bullet and got YouTube Premium. Now, the Premium service, overall, is a good service. I think it’s well worth the money considering what you get in return. But in this particular review, I’ll focus on YouTube Music. Let’s start with the browser version for desktop. As far as I know, there’s no standalone app for desktop (there are some apps, but they’re offered by 3rd parties), but you can access YouTube Music directly at music.youtube.com. I like the clean opening page with some YouTube recommendations and playlists based on your listening history. They kept the desktop design as neat as possible, which may not work for some, but I like it. The search results, however, aren’t always accurate. They are a new service so perhaps they need to update their databases, but accuracy is critical for any music service so it’s one area they’ll want to look into. I also didn’t see any option to view songwriting credits or lyrics. Google already has a massive lyrics database (you can see it if you search for any lyrics) so I don’t know why the synch between services hasn’t happened yet. Maybe I’m missing it but I looked through all menus, it shouldn’t be difficult to get information on the song you’re listening to. It’s a good start for YouTube, but the desktop version is not quite there yet. The design is promising and easy to navigate; but the search results and additional information need some work. YouTube Music (Desktop) screenshot. 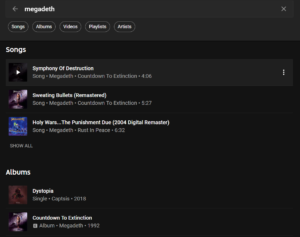 Notice how the search for Megadeth returns results from a band called Captsis. Megadeth does have an album called Dystopia, but obviously, this one isn’t it. The mobile app for YouTube Music again offers a neat design. They actually did a good job of keeping the feel of the service the same. A lot of people, myself included, listen to music mostly on their mobile devices. So, it makes perfect sense that the app would have a more interesting design. I love how big the artwork looks when I listen to a song – if you care about album covers as much as I do, you’re gonna love it! But the same issue persists if you’re looking for songwriting info or lyrics. Having said that, the mobile app makes it easier to see all the different formats you can access: songs, albums, artist page, playlists, videos, etc. But you do get some random results where it looks like it’s a video and then it plays something else. Again, that’s an issue of accuracy. The thumbnails need some work. The reason why that’s important is it can either make you think you’ve found what you were looking for when you actually didn’t or vice versa. In general, I think YouTube Music is off to a good start and has the right idea about design, but their database isn’t as accurate as its competitors and the side features need improvement. They have all the info – I mean, don’t we all complain that Google knows a little too much? – so there’s no reason why we can’t get some additional information. And if that information were already available in both desktop and mobile, they need to be more prominent. Spotify offers a standalone desktop app, along with its mobile app. On the desktop version, I like the opening page a lot as it’s less about your history but more about what else you can listen to. It’s great for discoveries or recommendations to get you started if you’re not sure what you want to listen to. They have a very clear genre breakdown towards the bottom of the page, and because they have access to podcasts and audiobooks, they can offer a lot more than music. It’s a great way to compete with iTunes on podcasts. And since YouTube Premium also offers a lot more than music, this is a good way to compete with them too. I’ve found it really easy to access albums, create and modify playlists, and save artists or albums so I can access them later. The design also isn’t too complicated. But one thing I found confusing is when you go to “Artists”, you see artists you’ve followed, as well as artists from whom you’ve maybe added one or two albums. I think a distinction here would be better. I’d like to see all the artists I’ve followed in one list so the list doesn’t get crowded with others where I may have saved one album or two. It’s not a problem at the moment because I use iTunes more than I do Spotify so I haven’t added all my favorites yet. But at some point, it’s going to become a problem. Also, when you go to “Albums”, there’s nothing from the artists you’ve actually followed. Just as an example, I followed Megadeth and Iron Maiden. But when I go to the Albums menu, there’s nothing from them listed there. Why would I not want to see albums from the artists that I like so much that I opted to follow them? Luckily, if you go back to Artists and click on the ones you’ve followed, you can see all their albums there. But make sure you go for the grid view because the list will take ages for you to scroll around to find the album you’re looking for. You can get some songwriting credit information on some songs, but it’s very limited. Even for some very popular artists, the credits don’t offer a lot of info. But at least I get some information, which I didn’t see at all on YouTube. And just like YouTube, Spotify didn’t offer any lyrics on the desktop version. Before I get to its mobile version, one thing I loved about Spotify is the selection. Now, I don’t have any numbers to back this up, but based on the artists I like, it felt like Spotify offered a wider selection. More albums were available there than on the other two platforms. This, of course, will differ from artist to artist depending on what the band or the record company (or companies) negotiated, but for the most part, I think Spotify takes the cake on this one. I’ve enjoyed discovering some gems I either hadn’t seen before or had limited exposure to. The mobile version for Spotify is pretty similar to its Desktop offering. Just like the other two companies, the mobile version is a little bit easier to use because all of these services designed their products with mobile devices at the forefront. It’s very easy to access the artists you’ve followed, the playlists you’ve created, check out Spotify’s recommendations and get to your music right away! Of course, some of the improvement areas I mentioned for the desktop version is also true for mobile. Again, the selection of the music is impressive; but I always get the feeling that Spotify was meant for playlists or just random shuffling in general. When you click on albums, you don’t even get any numbers next to tracks. Are these listed in the correct order of the album? You’d know the answer if you know the album from before. But if you don’t, you’ll have to trust that Spotify has the correct order. Spotify just wants to get clicking, there’s not a lot of emphasis on albums which I didn’t like. I think that kind of style works for a lot of people. To be fair, it can be great when you want to discover new artists, but even when I do discover a new artist, I don’t like discovering random songs of theirs. I want to get a feel for an album and I want to see all albums listed neatly with tracks clearly stated. I don’t always get that with Spotify even though the selection is stellar. As much as I like streaming, one area of concern, in general, is how the audiences are shifting from listening to albums to listening to random songs here and there. In fact, if you look at interviews with artists from all genres, a lot of them have either stopped releasing full-length albums or they are doing so much less frequently than they did before. I don’t blame them. You’ve got to figure out what works financially and I can easily see that people don’t buy a lot of albums anymore. Most streaming services try to sell you the idea that you can just grab a “song” any time you want. If not that, then you are encouraged to listen to “playlists” and not albums. Of course, you should have those options if you’re in the mood for a certain track at a given time; but I resent the fact that we are now entering a more “single” based industry than albums. Artists are discouraged to make albums and that’s a shame. I’ll always enjoy a full-length album more than just singles here and there. 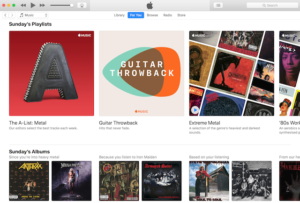 iTunes has the right idea to shine more light on albums; but, in general, it is no secret that the convenience brought upon by streaming made it easy for people to not really go through an entire album. You’d be missing out a lot if you only paid attention to “popular” tracks. There’s so much to an artist’s output than what meets the “metrics”. This is by no means an exhaustive review. I’m sure there are aspects that I didn’t cover here. Also, I completely acknowledge that I was an iTunes user way before I subscribed to Apple Music, so there already was a familiarity there. I enjoy YouTube Music (but especially YouTube Premium) and Spotify, but when it comes to ease of use, overall design, information on artists and songs, lyrics, and the catalogs, I think Apple Music is far ahead of the game. Your opinion might be different and that’s fine. iTunes isn’t always well-liked by folks. But I’ve really enjoyed what they brought to the table. I will always buy CDs as long as they are available, but streaming is a great way to listen to music and discover new artists. I appreciate what all these services are hoping to do. Let’s hope all artists, not just the big established ones, get fairer pay from streams so we can all continue to enjoy all this beautiful music we’ve been given. Since this article strictly covers my personal opinion on 3 services I subscribe to, there were no additional resources used.